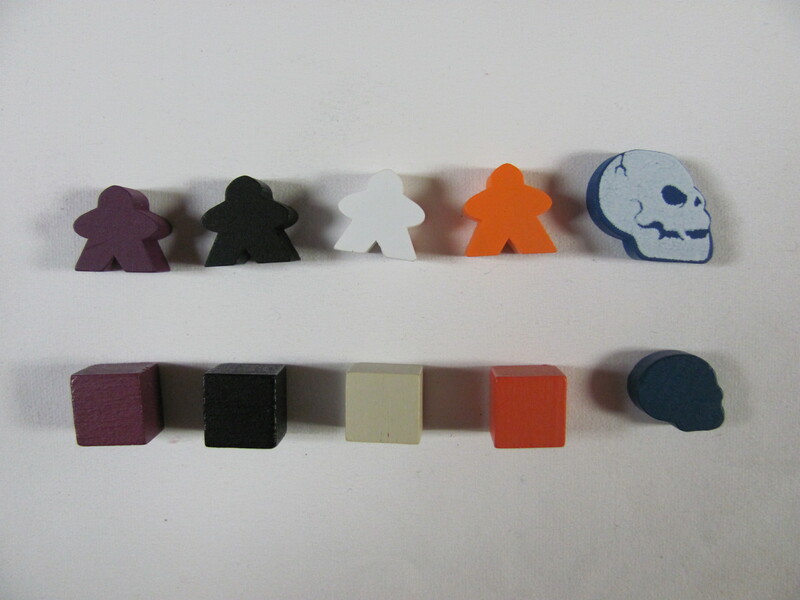 Meeples, those vaguely-human-silhouette wood playing pieces, have become the symbol of modern strategy board games. Originating in Carcassonne and later named by gamers, meeples have been adopted as the standard piece in many other games and have come to adorn a variety of gamer accessories, be a common element of game-related logos, and feature as characters in board game comic strips. Meeples have also over time taken on a variety of outlines, with animals and fantastic creatures joining the mix. Sometime in this evolution, Meeple Source was established by two fans of the little people-ish pawns, Cynthia and Chris Landon. The company, in business for 3 years, has developed a product line that includes apparel, housewares, decals, jewelry, and of course, game pieces—everything an aficionado could want. 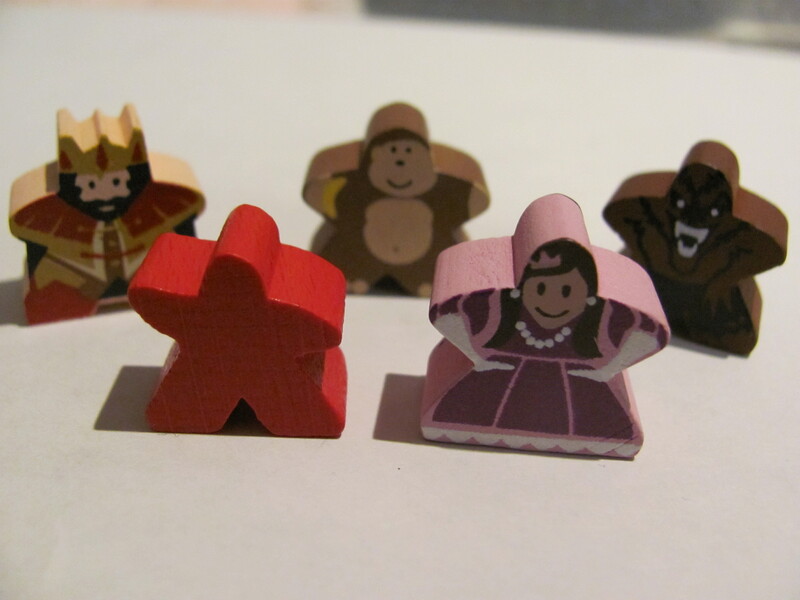 It’s specialty, though, is character meeples—meeples in traditional shapes painted to represent various characters, such as knights, zombies, princesses, monkeys, jesters, pirates, mummies, cavemen, and others. The picture above [click it for a larger view] gives you an idea of what just a few of these character meeples look like (with another meeple out of Carcassonne: Hunters and Gatherers for comparison). They can be used in games of your own design, as enhancements to a game you love, as toys, as decorations, as party favors. I’ve found meeples from Meeple Source to be not only cute but of high quality and durable. 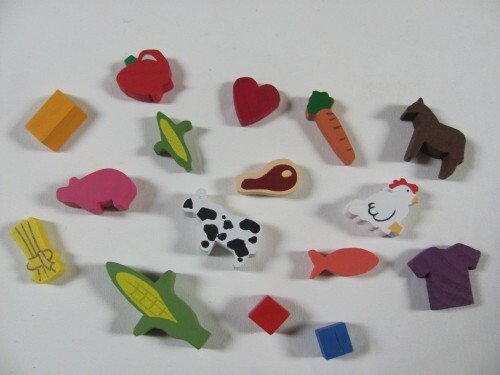 In addition to character meeples, Meeple Source makes and sells a variety of wood resource pieces, victory point tokens, and money-replacement discs. Some are available in sets as upgrades for popular games. These include corn pieces for T’zolkin, animeeples for Agricola, and mini-meeples for Lords of Waterdeep. I can’t enumerate all the variety of shapes that Meeple Source has available. I recommend you take a look at the company’s website. While the selection at Meeple Source is impressive, the company is underway with a Kickstarter project to fund production of character meeples that would more than double the number currently offered. Among those planned are: spy, minotaur, Cthulhu, dragon, police, skeleton, angel, frog, and yeti. Also planned are a set of germ tokens and character meeples for Pandemic (researcher, scientist, medic, etc.) and character meeples for Lords of Waterdeep. In fact, the Lords of Waterdeep set will be available in male and female versions, while the Pandemic set has a mix of male and female professionals. Kudos to Meeple Source for that. Though the Meeple Source Kickstarter project has already surpassed its funding goal, it’s still a great opportunity to get character meeples at a fantastic price. Or y’know, just go to the website and order something now. Meeple Source is a Purple Pawn advertiser and provided a sampling of meeples and tokens free for review.